See for me Charles is my favorite wolf in all the books. I like him a great deal more than Adam and was happy to see him stepping into the spotlight a bit as these books go on. You mean there are people who DON'T think of Adam at totally inappropriate moments every day? Those are some strange people, I tell you. 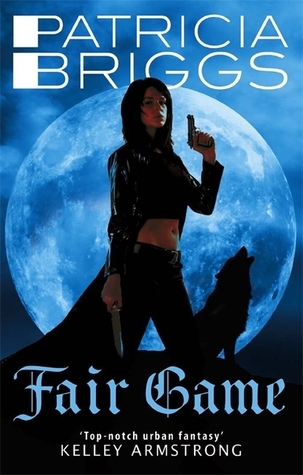 I agree that Fair Game is the best book Briggs has written (although she thinks it's Frost Burned). It's so well done on both sides, the private, relationship parts AND the murder mystery. It's practically flawless as far as UF goes and I'm glad you loved it as much as you did. And I actually agree about Anna and Mercy. I have so much love for my Mercy, but she is calculating at times, always three steps ahead of everyone else. Anna is competent too, but she acts emotionally and I find that easier to relate to. AHHHHHHH!!! Cannot wait for Fair Game Keertana! I so love Anna and Charles (almost as much as I love Mercy and Adam), so I need to hurry up and read Fair Game. I'd forgotten about their story for a while since there was a fairly significant gap in between the release dates for book two and this book, but now that I've read your review I have to run out and buy it:) 5 star read here I come! Yes! I do, too. I'm glad to hear you finally fell head over heels for Charles in Fair Game. ;) I really need to catch up with this series soon (the list is never-ending! ), but I can't wait now after these reviews. I'm glad you enjoyed both of these, Keertana! LOVED THIS BOOK! Patricia Briggs has created such an amazing world with characters to become enchanted with. This was my favorite of the Alpha and Omega so far.